that leverage or limit technology diffusion, acceptance, adoption, use and assimilation in a healthy digital society. that plague the country and contradict the historically positive values of the Brazilian society. We strongly support the peaceful social movements that will hopefully lead Brazil to a better future." as well as the power of individuals to protect themselves and their families." GTIS director Dr. Carlo Bellini is now at the senior editors board of IT & People, one of the leading journals in the field. He is also editor-in-chief of Brazilian Administration Review and associate editor of International Journal of E-Politics. GTIS's chief researcher Dr. Carlo Bellini received the "Organizational Leadership Award" during the 18th Conference of the Global Information Technology Management Association. The recognition is due to Dr. Bellini's leadership in South America's scholarly IT community. This is the second time Dr. Bellini receives the award, the other one being in 2008. GITMA is the world-renowned conference on global IT issues. Formerly an annual conference, it is now biennial, and it has been held in several different countries since 2000 – USA, Canada, Italy, India, Mexico, and Malaysia. For more information, please visit GITMA at: http://gitma.org/. Dr. Carlo Bellini was one of the panelists in the Meet the Editors Session during the 46th Annual Meeting of the Academy of Marketing Science (AMS) as editor-in-chief of BAR – Brazilian Administration Review, the flagship international journal of the Brazilian Academy of Management (ANPAD). He and other four journal editors in the business and marketing fields answered questions posed by Dr. James Boles, AMS's VP for publications. At the same conference, Dr. Rita Pereira presented two full research papers. Dr. Carlo Bellini is the newly appointed editor-in-chief of BAR – Brazilian Administration Review. Since 2004, BAR is the open-access, international flagship journal of the Brazilian Academy of Management (ANPAD). He will substitute current editor Dr. Salomão Alencar de Farias (UFPE, Brazil) on May 2nd, 2018. Dr. Bellini expresses his gratitude to ANPAD's presidency for the appointment, and thanks Dr. De Farias for the good hard work done so far. Rony Rodrigues Correia presented his doctoral dissertation as a requisite for the PhD degree in Management & Information Systems at UFPB. Rony surveyed the external factors that act on individuals as triggers for task procrastination. He focused the study on IT professionals working in a public university, that is, he discussed procrastination among rather autonomous professionals (the IT workers) in a type of organization (universities) where work is performed in rather autonomous ways. 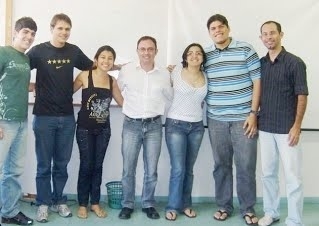 The committee for his dissertation was: Dr. Décio Bittencourt Dolci (FURG), Dr. Alexandre Reis Graeml (UTFPR), Dr. Carlos Eduardo Cavalcante (UFPB), Dr. Diogo Henrique Helal (FUNDAJ), and Dr. Carlo Bellini (UFPB, supervisor). GTIS met at Lovina Beach Club to celebrate the team's achievements in 2017, including an Emerald Literati Award, an AMCIS Track Award, the growing number of members, and a series of investments in experimental design. It was also an opportunity to strengthen the personal ties through friendship, family connection, spirited conversations, tasty meals, beach soccer, racquetball, and, of course, sun tanning and swimming. May 2018 be another year marked by our age quod agis spirit - focus and concentration on the best we can do! Article "Organizational structure and enterprise systems implementation: Theoretical measures and a benchmark for customer teams", by Carlo Bellini, Rita Pereira, and João Luiz Becker, published in 2016 in Emerald's journal IT & People, was awarded Highly Commended Paper, 2017 Emerald Literati Network Awards for Excellence. This means that the article is among the three that attracted particular attention of Emerald's editorial team. José Augusto Lopes Viana presented his dissertation as a requisite for the MS degree in Management Science (Management Information Systems) at UFPB. He carefully analyzed the social engineering practices and the likelihood of people adopting positive or negative behaviors to be protected against. His study is particularly important in the present moment of the Brazilian society and economy, since digital crimes are escalating along with other crimes. Also, his study is part of the field's current interests on cyber-security. In fact, technologies and individual and organizational behavior account for the mechanisms to address the security of one's assets. The committee for his dissertation was: Dr. Alexandre Graeml (UTFPR), Dr. Francisco "Franzé" da Costa (UFPB), and Dr. Carlo Bellini (UFPB, supervisor). GTIS researcher Dr. Carlo Bellini is co-chair for track Enterprise Systems & Knowledge Management at 10th Conf-IRM (Santiago, Chile, May 17-19), co-chair for track Latin America at 23rd AMCIS (Boston, MA, August 10-12), associate editor for track Digital Ecosystems at 25th ECIS (Guimarães, Portugal, June 5-10), and associate editor for track Service Science & Information Systems at 38th ICIS (Seoul, South Korea, December 10-13). GTIS researchers had an intense agenda in academic conferences in 2016, including AMCIS, SEINFORMS, GITMA, ENANPAD, and ISLA. Please see the full schedule and paper titles in the Agenda. The World IT Project is a huge endeavor involving more than 40 countries. It is headed by Dr. Prashant Palvia, a leading scholar from the Department of Information Systems & Supply Chain Management, Bryan School of Business & Economics, University of North Carolina Greensboro, USA. This October, GTIS researcher Dr. Carlo Bellini presented the first results of the Brazilian Chapter at the project's headquarters (see here) to an enthusiastic audience formed by faculty members and PhD students. The study called "Turnover and turnaway of information systems/technology professionals during a national crisis and across age groups" was developed by Dr. Bellini, Dr. Valter Moreno (UERJ, Brazil), Dr. Alexandre Graeml (UTFPR, Brazil), Dr. Palvia, and by another core team member of the project – Dr. Tim Jacks (Southern Illinois University Edwardsville, USA). 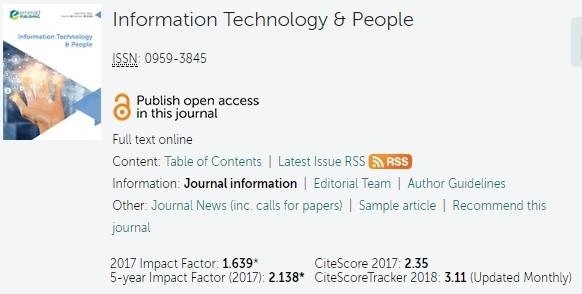 This study is expected to contribute in several ways to the IS/IT community worldwide, for its theoretical and applied insights on the patterns of job-related perceptions and intentions of IS/IT professionals during economic crises and across age groups. Flávio Perazzo Barbosa Mota presented his doctoral dissertation as a requisite for the PhD degree in Management & Information Systems at UFPB. Flávio did a thorough statistical analysis of secondary data about Internet use in Brazil and provided a new perspective on how Internet use relates to individual skills, attitudes, and socio-demographic factors. His research is particularly important for understanding the interplay between socio-demographics and the information and communication technologies, as well as to go beyond the digital divide discourse towards a digital effectiveness perspective – which is based not only on digital inclusion, but also on digital capabilities. The committee for his dissertation was: Dr. Brivaldo André Marinho da Silva (UFPB), Dr. Francisco José "Franzé" da Costa (UFPB), Dr. Cesar Alexandre de Souza (USP), Dr. Anatália Saraiva Martins Ramos (UFRN), and Dr. Carlo Gabriel Porto Bellini (UFPB, supervisor). Thales Pann Souza Rufino presented his dissertation as a requisite for the MS degree in Management Science (Management Information Systems) at UFPB. Thales did an experiment on anonymous behavior and the attitude towards risk in online, group conversations about public and private corruption. His research is particularly important in the present moment of the Brazilian society, which is fighting against corruption in an unprecedented way, and the virtual social networks are playing an impressively decisive role in this fight. The committee for his dissertation was: Dr. Brivaldo Marinho (UFPB), Dr. Guilherme Lunardi (FURG), and Dr. Carlo Bellini (UFPB, supervisor). GTIS researchers Dr. Carlo Bellini and Dr. Rita Pereira started their one-year term as visiting researchers at Bryan School of Business & Economics, University of North Carolina at Greensboro (UNCG). Dr. Bellini works with Dr. Prashant Palvia on the management of IS professionals and teams at the Department of Information Systems & Supply Chain Management, and Dr. Pereira works with Dr. James Boles on the nature of marketing research and practice at the Department of Marketing, Entrepreneurship, Hospitality & Tourism. Dr. Bellini and Dr. Pereira express their gratitude to Bryan's scholars and staff, as well as to UNCG's International Programs Center for their continuous support and kindness. GTIS researchers Dr. Carlo Bellini and Dr. Rita Pereira had an intense professional agenda in the USA last October when they visited universities in Connecticut, Maryland and North Carolina. At the University of Baltimore (UB), they met with Dr. Eusebio Scornavacca in order to discuss prospective research projects in the fields of Internet marketing and the management of IS professionals. Dr. Scornavacca is a leading researcher on mobile technologies and applications who presented a three-day seminar on technology and ubiquity at GTIS' homebase at João Pessoa, January 2013. At Central Connecticut State University (CCSU), Dr. Pereira discussed digital marketing, virtual social networks and the Brazilian consumer with undergraduate students attending Dr. Kuan Chiang's classes at the Department of Marketing. She also had informal meetings with Dr. Olga Petkova (information systems) and Dr. Nusser Raajpoot (marketing). At Eastern Connecticut State University (ECSU), Dr. Bellini discussed the management of IS professionals with undergraduate students attending Dr. Doncho Petkov's classes at the Department of Business Administration. And at the University of North Carolina at Greensboro (UNCG), they concluded the paperwork for their 2016 visiting scholar terms at that research university. Dr. Pereira will work with Dr. James Boles on the identity of the Brazilian marketing community, and Dr. Bellini will work with Dr. Prashant Palvia on the Brazilian data of the World Information Technology Project. On a more informal agenda, Dr. Pereira and Dr. Bellini took part of the "homecoming" parade for the 2015 academic year. Pedro Jácome de Moura Jr. presented his doctoral dissertation as a requisite for the PhD degree in Management & Information Systems at UFPB. Pedro researched on flow in IS/IT teams. He carried out three specific studies on the theoretical antecedents and consequents of flow, and on how to measure flow in practice. He finally proposed a specific study to address both performance and flow in IS/IT teams. His research was the first PhD research entirely developed as part of GTIS studies, and it is a landmark contribution to GTIS's line of research on the management of IS/IT professionals. The committee for his dissertation was: Dr. Valter de Assis Moreno Jr. (IBMEC/RJ), Dr. Alexandre Reis Graeml (UTFPR), Dr. Brivaldo Marinho (UFPB), Dr. Francisco José da Costa (UFPB), and Dr. Carlo Bellini (UFPB, supervisor). GTIS is proud to have organized the second ISLA conference. This conference discusses the role of information systems in society and the ways the discipline has evolved over the years, with a special attention to the idiosyncrasies of IS research and application in Latin America. The first ISLA conference was held in Curitiba, May 01-03, 2014, and it was a huge success as for the presence of renowned IS scholars both physically and in the real-time video-conferencing rooms. ISLA conferences innovate in many aspects, including a more personal account from the authors when writing their contributions, and the preference for contributions that explicitly address the conference's annual theme. Also, the conference has a geographically distributed format, that is, participants are stimulated to join individually or in groups from any part of the world and contribute through live video-conferencing with those who are located at the main conference site. Raissa Carneiro de Brito presented her dissertation as a requisite for the MS degree in Information Science at UFPB. Raissa researched on resistance to change (routine-preserving behavior) as a behavioral digital limitation/impairment. She implemented a series of focus groups and participant observations in a rural community nearby João Pessoa, Brazil, where she is part of a voluntary team that promotes general and digital literacy for anyone in that community who is interested. She researched the drivers of resistance and acceptance to participate in the educational activities, and she ingeniously associated some behaviors with a character of the Brazilian popular culture that sings "I was born this way, I grew up this way, I actually live this way, I'll always live this way." Her research was the fifth M.Sc. research on the validation of Bellini et al. 's (2010) seminal work on digital limitations/impairments. The committee for her dissertation was: Dr. Brivaldo Marinho (UFPB), Dr. Dulce Neves (UFPB), and Dr. Carlo Bellini (UFPB, supervisor). Last July, GTIS introduced another regular activity to promote joyful reasoning. Once a month, GTIS members meet to watch and discuss movies related to GTIS interests, usually concerning human-computer interaction and the alternative epistemological perspectives. CineGTIS so far exhibited Her, Disconnect, and The Secret. Dr. Carlo Bellini, Dr. Valter Moreno and the doctoral candidate Pedro Jácome presented papers at the 1st Information Systems in Latin America (ISLA) Conference (ISLA 2014), held in Curitiba, Brazil. The papers were "Paradigms in Information Systems Research: The Deinstitutionalization of Terminological Tradition in the Field’s Discourse" (Mota, De Moura Jr. & Bellini), "Relevância de Sistemas de Informação na Formação do Administrador Brasileiro" (Moreno Jr., Graeml & Bellini) and "Mensuração na Pesquisa Qualitativa: Avaliando Possibilidades Criticamente" (De Moura Jr.). The conference was an idea of Dr. Alexandre Graeml (UTFPR), who is an enthusiast of the IS field in Brazil. Starting with this first edition, the conference is expected to be held annually in a different city in Latin America. In 2014, the participants discussed the role of IS research in society and the ways the discipline has evolved over the years, with special attention given to the idiosyncrasies of IS in Latin America. Please visit http://bit.do/ISLA2014 to know more about ISLA 2014. The 2nd ISLA Conference (ISLA 2015) will be in João Pessoa, Brazil (the Easternmost city of the three Americas), April 18-20, 2015. Please be sure to schedule your participation. Malu Lacet Serpa presented her dissertation as a requisite for the MS degree in Management Science (Management Information Systems) at UFPB. Malu researched on overconfidence (excessive self-efficacy) as a cognitive digital limitation/impairment. She implemented a true experiment with 54 management students to assess the effects of feedback (positive, negative, and placebo) on the levels of self-efficacy and computer-mediated task performance. The task was based on the prisoner's dilemma to solve a productivity paradox problem. Her research was the fourth M.Sc. research on the validation of Bellini et al. 's (2010) seminal work on digital limitations/impairments. Malu received honors as a recognition for the dissertation's quality. The committee for her dissertation was: Dr. Gilson Ludmer (UFPE), Dr. Brivaldo Marinho (UFPB), and Dr. Carlo Bellini (UFPB, supervisor). 2013 was a special year for GTIS also in terms of projects approved by research agencies in highly competitive research calls. Miguel Mauricio Isoni Filho, a founding member of GTIS, presented his dissertation as a requisite for the MS degree in Management Science (Management Information Systems) at UFPB. Miguel researched on self-efficacy and anxiety as cognitive digital limitations/impairments. This research was the third M.Sc. research on the validation of Bellini et al. 's (2010) seminal work on digital limitations/impairments. Miguel received honors as a recognition for the dissertation and other great achievements during his studies (high grades and the publication of an article in qualified journal Análise). The committee for his dissertation was: Dr. Gilson Ludmer (UFPE), Dr. Guilherme Dias (UFPB), and Dr. Carlo Bellini (UFPB, supervisor). Comunicamos a aprovação do projeto Educação para Consumir: Proposição de Framework de Educação para o Consumidor à Luz da Pesquisa Transformativa do Consumidor, coordenado por Dra. Rita Pereira (GTIS) e com colaboração de Dr. Carlo Bellini (GTIS), Dr. Gesinaldo Cândido (UFCG), Dr. Salomão Farias (UFPE), Dr. Hugo Müller Neto (UFRGS), doutorandos Fábio Albuquerque (GTIS) e Márcio Carneiro, e mestre Miguel Filho (GTIS). O projeto foi aprovado no Edital MCT/CNPq 14/2013 - Universal, faixa B (até R$60 mil). Financiador: Conselho Nacional de Desenvolvimento Científico e Tecnológico - Auxílio financeiro. O grupo de pesquisa GTIS - Tecnologia da Informação e Sociedade foi mais uma vez destaque na TV do maior portal de Administração do país (www.administradores.com.br). Ao comentar sobre a segunda parte da entrevista ao programa ADM Talks, Carlo Bellini destaca: "neste novo vídeo, introduzimos um olhar pretensamente mais completo sobre a exclusão digital, que, em programas de políticas públicas, é tratada meramente como o acesso material e social às tecnologias de informação e comunicação (TICs). Afinal, é mais apelativo falar de coisas materiais do que promover educação básica, formação de caráter e controle de impulsos. Mas as experiências de vida (que alimentam nossa cognição) e o bom-senso (que regula nosso comportamento) é que verdadeiramente caracterizam a inclusão digital de cada indivíduo". Entre os dias 19 e 21 de maio, na cidade de Bento Gonçalves, Rio Grande do Sul, membros do GTIS, incluindo alguns pesquisadores e o coordenador do grupo, Prof. Carlo Bellini, participaram do IV Encontro de Administração da Informação sob promoção da Associação Nacional de Pós-Graduação e Pesquisa em Administração (ANPAD) e de responsabilidade da Divisão Acadêmica de Administração da Informação (ADI). Em abril, ocorreram duas defesas de dissertação de mestrado acadêmico de pesquisadores do GTIS: Rony Rodrigues Correia e Sheyla Natália de Medeiros. As pesquisas intitulam-se "Estrutura de Equipes-Cliente em Projetos de Implantação de Sistemas de Informação no Setor Público: Evidências em Reuniões por Videoconferência entre Organizações Federais" e "Limitações digitais comportamentais e de acesso entre participantes de redes sociais virtuais: um estudo sobre o gerenciamento de impressões". O primeiro, IV EnADI, é promovido pela ANPAD e se realiza entre os dias 19 e 21, em Bento Gonçalves (RS). Profissionais e Profissionalização em Tecnologia da Informação: Indicativos de uma "Metamorfose Ambulante"
O segundo evento, 6th Conf-IRM, é promovido pela AIS e se realiza entre os dias 22 e 24 de maio, em Natal (RN). O terceiro evento, 19th AmCIS, é promovido em associação com a AIS e se realiza entre os dias 15 e 17 de agosto, em Chicago (EUA). O grupo de pesquisa GTIS - Tecnologia da Informação e Sociedade foi destaque na TV do maior portal de Administração do país (www.administradores.com.br). Em entrevista ao programa ADM Talks, o líder do grupo, Prof. Carlo Bellini, comentou resultados de investigações da mestranda Daniella Garcia sobre cyberslacking - o uso de recursos informáticos da organização para fins pessoais de seus membros durante a jornada de trabalho. Descobriu-se que esse comportamento, porém,nem sempre caracteriza limitação digital comportamental, pois pode estar associado positivamente à satisfação e à produtividade do indivíduo no trabalho. ADM Talks #8 - Cyberslacking: a vadiagem realmente compromete o resultado? O professor e pesquisador brasileiro, Dr. Eusebio Scornavacca, diretor de pesquisa na School of Information Management da Victoria University of Wellington (Nova Zelândia), ministrou, no período de 21 a 23 de janeiro de 2013, o seminário intitulado "Quando os sedentários viram nômades: os desafios para a gestão de empresas na era da ubiquidade". O seminário foi organizado pelo Programa de Pós-Graduação em Administração (PPGA/UFPB). Nos dias 03 e 04 de dezembro de 2012, Miguel Mauricio Isoni Filho apresentou o projeto “Limitações Digitais: Formação Pessoal, Empoderamento Comunitário, Mudança Social” na Conferência Internacional Brasil Canadá 3.0. Esse projeto está registrado no Edital CNPq 14/2011 - Universal. Em 05 de outubro de 2012, realizou-se workshop do Projeto Universal CNPq "Limitações Digitais: Formação Pessoa,Empoderamento Comunitário, Mudança Social''. Contamos com a presença do Prof. Gilson Ludmer/UFPE, Profa. Rita de Cássia, Daniella Garcia e Miguel Isoni Filho, todos membros do projeto. Ainda, as mestrandas Malu Lacet e Sheyla Medeiros e o bolsista de iniciação Hélder também estiveram presentes para colaborar com os demais. In August 2012, GTIS received the visit of two members that research at FURG, Rio Grande, which is distant 4,500 Km from João Pessoa. Dr. Décio Dolci and Dr. Guilherme Lunardi took the opportunity to get to know face to face the other members of the research team and discuss research interests. GTIS started as a group formed by a few students under the supervision of Dr. Carlo Bellini, in November 2008.